Industrial transfer cars have many applications such as handling steel coils, molds & dies, fabricated structures and machine sub-assemblies. 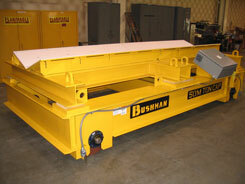 Bushman Equipment, Inc. engineers coil transfer cars to your exact specifications. 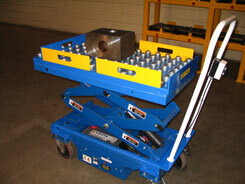 Fabricated of welded steel, this towable die cart is a flexible addition to your operation. The top platform is fitted with super-rail low friction roller sections for easy die transfer. 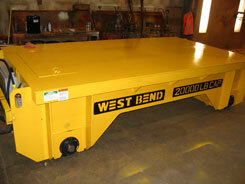 It features a fabricated steel hitch pin so that a forklift can move it easily around the plant. 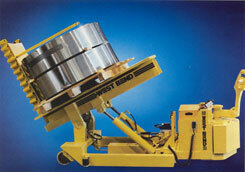 This free-ranging, custom-engineered coil mounter moves easily throughout a plant. It combines the benefits of fork trucks, upenders and coil cars to maximize productivity. Designed to handle a wide range of coil sizes and weights. Available with 12- or 24-volt DC motors, this steerable, walk-along coil mounter handles steel and wire coils as well as rolled products like paper or plastic. Standard features include batteries and built-in chargers. Available options include non-marring surfaces to minimize damage to special materials. 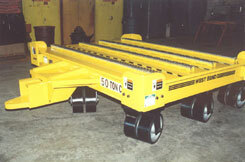 This 50-metric ton capacity coil transfer car can transport two 25-metric ton coils. Replaceable wear pads protect the coil surface. The operator walks along with car, operating it from a hand-held pendant. 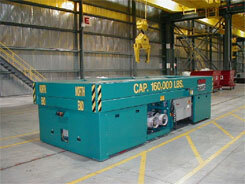 This 20,000-pound capacity transfer car is used to move stamping dies. The transfer car is battery powered, eliminating the need for a cable reel or other external means of getting electrical power to the car. 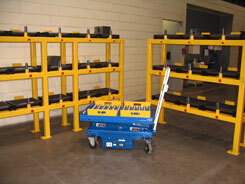 This 1,000-pound capacity push die cart has a battery powered hydraulic lift and includes a die storage rack system. 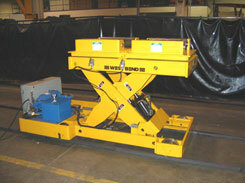 This scissors lift coil transfer car has motorized rotation. 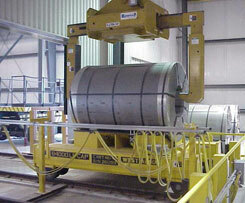 It is rated for 15,000-pound capacity and is designed to handle aluminum coils. 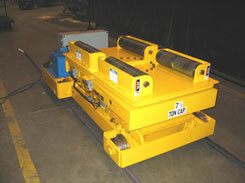 The coil is supported by gravity type rollers to allow for proper coil tail orientation. 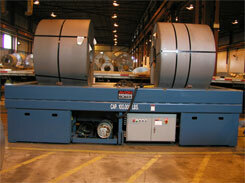 Propane powered transfer cars are used for handling coils, dies and molds. Anti-collision sensors will stop the unit. Auto shut-down when transfer is completed. Coil car automatically steers to follow a floor wire. Can be operated by attached pendant, remote radio or full automation. Urethane covered wheels rated to run on a level industrial concrete floor. Economic installation. No rails required. Easy to relocate when needs change. Unlimited travel – no power cable needed.